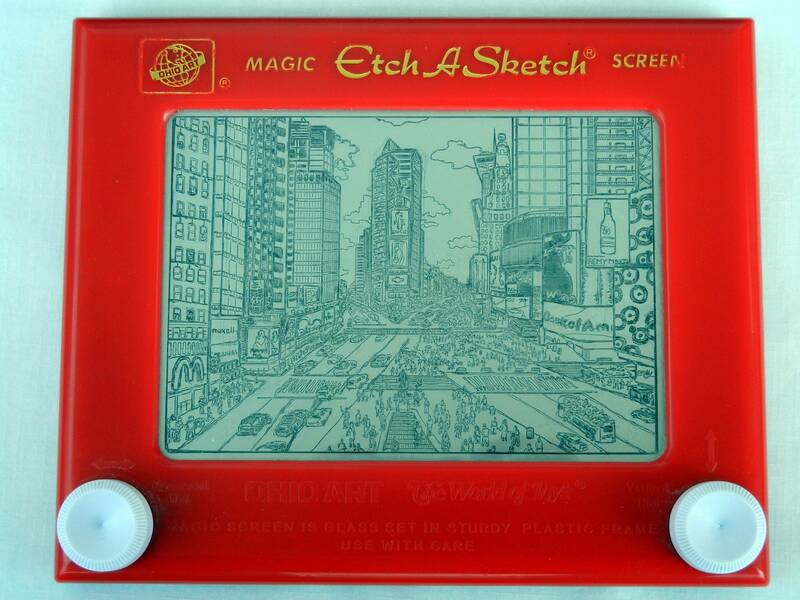 Bryan Madden sometimes spends upwards of 50 hours bringing a single Etch A Sketch masterpiece to life. Totally worth it! “Patience is the most important aspect of what I do,” says artist Bryan Madden. When your canvas of choice is an Etch A Sketch, patience is a virtue one cannot do without. You’ll remember the Etch A Sketch from Toy Story, music videos, and your childhood as the red rectangle with white knobs you used to draw grainy pictures. Turning each knob led an internal stylus up a rigid x- or y-axis to create rudimentary art. Of course, it’s also possible to make art that is less rudimentary with the device, too. For the past several years, Madden has been keeping a blog of his Etch A Sketch drawings, producing lavishly detailed landscapes of New York, San Francisco, and the like, and also pop culture detritus, such as album covers. Sometimes he even draws his Facebook fans. Despite stemming from a child’s toy, the artist’s work is worlds away from the stuff of Show and Tell. Madden’s drawings go against the inherent disposability of the Etch A Sketch. Children playing with the toy would eventually–and sometimes very quickly–shake it up and erase whatever was on display. When sinking a substantial amount of time and creative energy into making something that transcends the Etch A Sketch’s intended skill level, though, you’ll want to keep it around for a while. As Etch A Sketches give way to iPads for the next generation of bored children learning to draw stuff, the future of the device is unknown. Madden remains optimistic about the toy remaining in the repertoire, though. Have a look at more Etch A Sketch art in the slides above.